Five young men who were employed to clean a septic tank in an upmarket residential community died during the process. Around the same time as the Delhi incident, five workers died in a septic tank in Odisha. Manual scavenging is a term used mainly in India for a caste-based occupation involving the manual removal of untreated human excreta from bucket toilets or pit latrines by hand with buckets and shovels. Manual scavenging has been officially prohibited by law in 1993 due to it being regarded as a dehumanizing practice (if not done in a safe manner). The act says National Commission for Safai Karamcharis (NCSK)would monitor implementation of the Act and enquire into complaints regarding contravention of the provisions of the Act. What does the Prohibition of Employment as Manual Scavengers and their Rehabilitation Act, 2013 say? A violation can be punished with two years of imprisonment or fine or both. Under the provision, no person, local authority or agency should engage or employ people for hazardous cleaning of sewers and septic tanks. Mechanised cleaning of septic tanks is the prescribed norm. The law (Prohibition of Employment as Manual Scavengers and their Rehabilitation Act, 2013) is not being enforced, and there is no fear of penalties. In spite of a well-funded programme such as the Swachh Bharat Abhiyan in operation, little attention is devoted to this aspect of sanitation. The requirements of worker safety and provision of safety gear for rare instances when human intervention is unavoidable are often ignored. The Ministry of Drinking Water and Sanitation in its manual of 2016 on toilet design acknowledges that in rural areas, mechanical pumps to clear septic tanks are not available. In the southern States, sanitation has expanded along with urbanisation, but it has brought with it a higher number of deaths as workers clean septic tanks manually. For instance, Tamil Nadu recorded 144 fatalities of workers engaged for septic tank cleaning in the past three years, according to official data. Toilet designs proposed by the government include those in which fully composted waste must be removed from pits every two years. In the absence of political will and social pressure, more lives could be lost because more tanks are being built in rural and urban areas as part of the drive to construct toilets. If the law on manual scavenging is to be effective, the penalties must be uniformly and visibly enforced. It is equally important for State governments to address the lack of adequate machinery to clean septic tanks. The Centre must ensure that the proposals for new toilet design does not become a fresh avenue to oppress members of some communities who are expected to perform such work, reflecting social inequalities. The incident is a shocking reminder that India’s high-profile sanitation campaign has done little to alter some basic ground realities. India’s sanitation problem is complex, and the absence of adequate toilets is only one lacuna. The Swachh Bharat Abhiyan should make expansion of the sewer network a top priority and come up with a scheme for scientific maintenance that will end manual cleaning of septic tanks. The law should be enforced vigorously to eliminate manual scavenging in its entirety. Excess rains and floods in Kerala, deficit rainfall in eastern and north-eastern India, and associated large-scale crop losses have again highlighted the need for providing social protection to poor farmers. A highly subsidised Pradhan Mantri Fasal Bima Yojana (PMFBY) was launched in 2016 to provide insurance to farmers from all risks. The scheme’s total expenses today are almost Rs. 30,000 crore. In comparison to earlier schemes, the PMFBY is more farmer friendly, with sums insured being closer to the cost of production. The scheme’s linkage with parallel programmes like the ‘Jan Dhan Yojana’ and ‘Digital India’ makes it a truly inclusive and welfare-based scheme. The scheme therefore led to increased coverage of 5.7 crore farmers in 2016 and the sum insured crossed ₹200,000 crore. However, notwithstanding its ambition and intent, the scheme since its operation has been scrutinised more for its misses than its hits. Consequently, in 2017, the expansive coverage of the scheme suffered some setback as seen in a drop of nearly one crore farmers in enrolment (about 17%). Such shortcomings inspired recent announcements such as that of Bihar to start its own scheme, the “Bihar Rajya Fasal Sahayata Yojna”. How can the scheme be made more effective? Faster and appropriate claim settlement: Timely estimate of loss assessment is the biggest challenge before the PMFBY. The weakness of the PMFBY (and most likely for the Bihar variant) is the methodology deployed for crop loss assessment: the crop cutting experiments (CCEs). Crop Cutting Experiments: are periodic exercises conducted nationwide every season to determine crop yields of major crops. Sample villages are chosen through scientifically designed surveys, and crops are physically harvested to determine yields. These experiments require huge capital and human resources and have to be done simultaneously all over India in a limited time. Therefore, they have large errors. Improvement in the efficacy of the PMFBY: technology use must be intensified. With options available today, such as detailed weather data, remote sensing, modelling and big data analytics, the exercise of monitoring crop growth and productivity can be not only more accurate and efficient but also resource saving. Hybrid indices, which integrate all relevant technologies into a single indicator, are good ways to determine crop losses. Their deployment can assist in multi-stage loss assessment and thus provide farmers with immediate relief for sowing failure, prevented sowing and mid-season adversity apart from final crop loss assessment. Creation of an online portal: the whole process of monitoring can be made accessible and transparent to farmers, policy-makers and insuring agencies alike through an online portal. Immediate claims settlements can be made once this is linked to the process of direct benefit transfers. Universal and free coverage for all smallholders: Farmers’ awareness about the scheme and crop insurance literacy remain low in most States, especially among smallholders in climatically challenged areas in most need of insurance. The complicated enrolment process further discourages farmers. To increase insurance coverage a system should be thought of whereby farmers do not need to enrol themselves and every farmer automatically gets insured by the state. This will provide social protection to every farmer if the full premium of smallholders is also paid by the state. In the process, coverage can go up almost 100%. Such differential subsidies are already applicable in urban areas for water and electricity. Improved and transparent insurance scheme design: Insurance companies are supposed to calculate actuarial rates, and based on tenders, the company quoting the lowest rate is awarded the contract. It is often seen that the rates quoted by companies for the same region and for the same crop varying from 3% to more than 50%. Such large variations are irrational. One reason for such inflated premiums is lack of historical time series of crop yields at the insured unit level. To minimise their risks caused by missing data and to account for other unforeseen hazards, insurance companies build several additional charges on pure premium. Science has the capacity today to characterise risks and reconstruct reasonably long-time series of yields. The premium rates, and hence subsidy load on the government, can come down significantly if we make greater use of such proxies and appropriate sum insured levels. If a comprehensive social protection scheme is implemented, there would be opportunities for further rationalisation of subsidies. The government today spends more than Rs. 50,000 crore annually on various climate risk management schemes in agriculture, including insurance. This includes drought relief, disaster response funds, and various other subsidies. Climate-risk triggered farm-loan waivers are an additional expense. All these resources can be better utilised to propel farm growth. Reinvigorating the crop insurance scheme will provide better social protection to every farmer. 3. Where goes the rupee? Rising crude oil prices in global markets and strengthening dollar has dragged the rupee below the 73 per dollar mark. It was just under 64 at the beginning of the year. There is now intense debate in the media on whether the Reserve Bank of India (RBI) should step in and take steps to defend the dollar. The term devaluation is used when the government reduces the value of a currency under Fixed-Rate System. When the value of the currency falls under the Floating Rate System, it is called depreciation. Revaluation is a term which is used when there is a rise in currency value in relation with a foreign currency in a fixed exchange rate. In the floating exchange rate regime, the correct term would be appreciation. A long time ago, the ‘standard’ or textbook prescription for countries with severe balance of payments deficits was to devalue their currencies. The underlying rationale was that devaluation decreases the price of exports in foreign countries and so provides a boost to exports by making them more competitive. Correspondingly, imports become more expensive in the domestic economy, in turn reducing the volume of imports. Fortunately, the RBI has a huge stock of foreign exchange reserves and so the balance of payments situation is not (at least in the immediate future) the main cause of anxiety for the steady decline in the value of the rupee. What must concern policy-makers is that the slide in the rupee can have adverse effects on the domestic economy. For instance, the surge in the landed price of crude oil has already resulted in a steep rise in the prices of petroleum and diesel. Diesel price hikes increase the cost of transportation of goods being transported by road. Unfortunately, many food items fall in this category. Obviously, any increase in food prices must set alarm bells ringing in the Union Finance Ministry. The devaluation will also increase prices of imported inputs, particularly those for which there are no alternative domestic sources of supply. This can have some effect on output expansion. Many domestic companies that have taken dollar loans will also face significantly higher servicing costs. Finance Minister has rightly observed that external factors are the cause. In particular, global capital and perhaps currency speculators have been flocking to the American economy. This is not really surprising because the U.S. economy has become a very attractive option. Some months ago, U.S. President Donald Trump announced a massive decrease in corporate tax rates. More recently, the U.S. Federal Reserve has also increased interest rates. The icing on the cake for global investors’ is the booming U.S. economy. The dollar has appreciated sharply against practically all other currencies too. For instance, it has moved up against both the euro and the pound. Developing economies are typically even harder hit since global portfolio investors tend to withdraw from these markets, perhaps because their economic or political fundamentals are relatively more unstable. Countries such as Turkey and South Africa have experienced significantly higher rates of devaluation than India. If several countries are devaluing at the same time — as it seems to be happening now — then none of these countries benefit from their exports being cheaper abroad. In other words, there may not be any surge in Indian exports following the current round of devaluation. Neither will there be a huge fall in imports. Crude oil is by far the biggest item in the list of Indian imports, and this is price-inelastic. Imports from China now constitute a tenth of overall imports. Since the yuan has also depreciated against the dollar, there is not much reason to believe that Chinese imports will be costlier than earlier. The problems caused by the spiralling prices of petroleum products can be addressed in the following manner. Both the Central and State governments earn huge revenues from excise duties and value-added tax (VAT) on petrol and diesel. In fact, excise duties were raised in the recent past merely as a revenue-gathering device. Now that the rupee cost of crude has shot through the roof, the Centre should certainly lower duties. Rates of VAT should also be lowered by State governments. A small reduction in VAT may even be revenue neutral since VAT is levied as a percentage of price paid by dealer. The RBI has several policy options. It could the most direct route — of offloading large amounts of dollars. This would increase the supply of dollars and so check the appreciation of the dollar, but at the cost of decreased liquidity. Clearly, this weapon has to be used with caution. The RBI does intervene in the foreign exchange market from time to time to manage a soft landing for the rupee, and this has to continue. The Central bank now has an explicit inflation target of 4%, a level that is almost certain to be breached if the rupee remains at its current level. This is very likely to induce the Monetary Policy Committee (MPC) of the RBI to raise interest rates again in order to reduce the inflationary tendencies. The MPC must moderate any rate increase. Any sharp increase has an obvious downside risk to it — any increase in interest rates can have an adverse effect on growth. This can actually backfire if profitability of companies goes down. Any ‘big’ negative change in profitability may make foreign portfolio investors pull out of Indian stocks and actually exacerbate the rupee’s woes. The best option for the government would be to borrow from non-resident Indians (NRIs) by floating special NRI bonds that have to be purchased with foreign exchange, and with maturity periods of at least three years. Interest rates have to be attractive, and investors must of course be protected from exchange rate fluctuations. Since interest rates in countries like the U.K. and even the U.S. are quite low, the promised interest rate does not really have to be very high by prevailing Indian levels. Further, the term limit imposed on borrowings of manufacturing companies is to be shortened further in order to curb dollar demand. The response to the move from the markets will need to be carefully tracked. The steps to strengthen the rupee in the short term are welcome, given the large-scale outflow of capital from emerging markets to the West. These ad hoc steps to avoid an immediate crisis in the external sector, however, should not deflect attention from the more fundamental reasons behind the decline of the rupee. India has been unable to boost exports over the years for various reasons. At the same time, it has been unsuccessful in finding sustainable domestic sources of energy to address the over-reliance on oil imports. This has meant that the rise in the price of oil has traditionally exerted tremendous stress on the current account deficit and the currency. The depreciating rupee is also a symptom of persistently higher domestic inflation in India over many decades. For example, in line with vastly different inflation rates in India and the U.S., the rupee has lost about 60% of its value in the last 10 years against the dollar. This problem cannot be addressed without drastic changes in the style of monetary policy conducted by the RBI, which is an unlikely proposition. At the moment, what must be avoided is any sharp fluctuation in the exchange rate — in either direction. Neither the government nor the RBI can afford the option of inaction. The other extreme of knee-jerk, overkill options must also be avoided. The government must now make use of moderate but effective instruments available. It has to think of a long-term plan to boost exports, preferably through steps that remove policy barriers that are impeding the growth of export-oriented sectors, in order to find a sustainable solution to the problem of the weakening rupee. India’s ‘Diamond City’ offers a lesson for the country’s ever-expanding cities on water management and the optimal use of water, which is rapidly becoming a scarce resource. 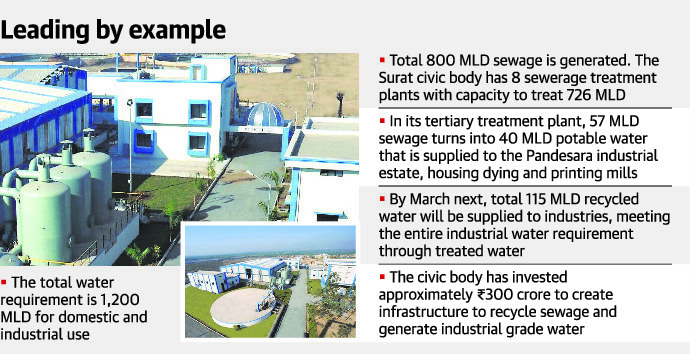 Surat’s civic body is setting up state-of-the-art sewage treatment plants (STPs) to ensure every drop of waste water is treated and reused for purposes other than drinking. Physical, chemical, and biological processes are used to remove contaminants and produce treated wastewater (or treated effluent) that is safe enough for release to the environment. A by-product of sewage treatment is a semi-solid waste or slurry, called sewage sludge. The sludge has to undergo further treatment before being suitable for disposal or application to land. Sewage treatment may also be referred to as wastewater treatment. However, the latter is a broader term which can also refer to industrial wastewater. For most cities, the sewer system will also carry a proportion of industrial effluent to the sewage treatment plant which has usually received pre-treatment at the factories themselves to reduce the pollutant load. If the sewer system is a combined sewer then it will also carry urban runoff (stormwater) to the sewage treatment plant. Disposal of domestic sewage from cities and towns is the biggest source of pollution of water bodies in India . All Class I cities and Class II towns together generate an estimated 29129 MLD sewage (as per population in 2001 census). Against this, installed sewage treatment capacity is only 6190 MLD. There remains a gap of 22939 MLD between sewage generation and installed sewage treatment capacity. In percentage this gap is 78.7 %. Another 1742.6 MLD sewage treatment capacity is under planning or construction stage. If this is also added to existing capacity, even then there is a gap of 21196 MLD (equal to 72.7 %) in sewage treatment capacity. CPCB has prepared and published a report ‘Status of sewage treatment in India‘. This reports analyzes and presents in detail the gap between sewage generation and treatment capacity, the technologies used for sewage treatment in India, performance of 115 sewage treatment plants studied by Central Pollution Control Board with plant-specific technical remarks and also discusses the efficacies of various treatment technologies. The actual capacity utilization of STPs is only 72.2% and as such only 13.5 % of the sewage is treated. This clearly indicates dismal position of sewage treatment, which is the main cause of pollution of rivers and lakes. To improve the water quality of rivers and lakes, there is an urgent need to increase sewage treatment capacity and its optimum utilization. State Governments should realize the problem of pollution of water bodies and pay attention to their liability to set up sewage treatment plants in cities and towns to prevent this pollution. This activity requires to be recognized as one of the most important indicators of overall development of the States. If not realized urgently, this problem is fast going to magnify to an unmanageable level. From March 2019, the Surat Municipal Corporation (SMC) will be supplying 115 MLD (million litres per day) treated water to industries located within the city, in order to meet the entire industrial requirement of water through treated or recycled water. The entire quantum of water will be treated from domestic sewerage water in tertiary treatment plants at the Bamroli and Dindoli areas for supplying to mainly textile factories in the Pandesara and Sachin industrial clusters housing over 400 dying and printing units. At present 40 MLD treated water are being suupplied to industries in Pandesara in the city. This is the largest capacity of tertiary water treatment in the country. In fact, Surat was the first city in the country to start selling recycled water to industries in 2014. Surat’s cost effective water management system is most advantageous for its contribution towards reducing the dependency on conventional resources of water, and thus optimal use of the resource. So far, the SMC has invested ₹ 280 crore in creating tertiary water treatment facilities in the city. By March next year, the corporation will save 115 MLD fresh water by supplying recycled water to industries. The SMC charges industrial units ₹ 23 per 1,000 litres of water. The civic body’s efforts to create infrastructure for water management is in line with the State government’s policy of promoting the use of recycled water for non-drinking purposes, and reducing dependence on ground water. India is facing its worst water shortage in history, according to a report by the Niti Aayog. Nearly 600 million Indians faced water stress and about 2,00,000 people die every year because of lack of access to safe water. The number of polluted stretches in India’s rivers has increased to 351 from 302 two years ago. The number of critically polluted stretches has gone up to 45 from 34, according to an assessment by the Central Pollution Control Board (CPCB). Hindon — Saharanpur to Ghaziabad — with a BOD of 48-120 mg/l. The higher the BOD worse is the river. The CPCB considers BOD less than 3 mg/l an indicator of a healthy river. The CPCB, since the 1990s, has a programme to monitor the quality of rivers primarily by measuring BOD, which is a proxy for organic pollution. The health of a river and the efficacy of water treatment measures by the States and municipal bodies are classified depending on BOD. The cultural significance of the Ganga is such that there’s been greater focus on it but many more rivers are far more polluted. However the CPCB says several of the river’s stretches in Bihar and Uttar Pradesh are actually far less polluted than many rivers in Maharashtra, Assam and Gujarat. 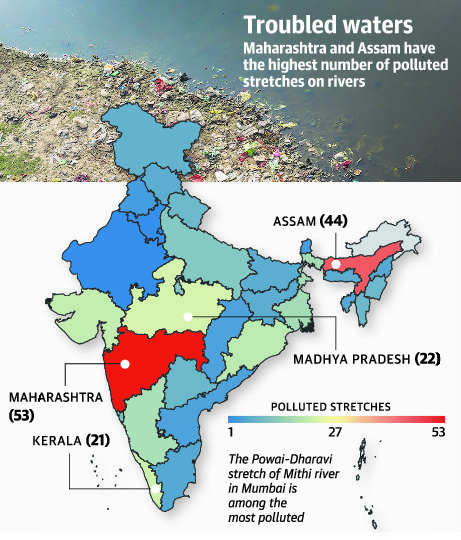 These three States account for 117 of the 351 polluted river stretches. Based on the recommendations of the National Green Tribunal, the CPCB apprised the States of the extent of pollution in their rivers. BOD is the amount of dissolved oxygen needed (i.e. demanded) by aerobic biological organisms to break down organic material present in a given water sample at certain temperature over a specific time period. The BOD value is most commonly expressed in milligrams of oxygen consumed per litre of sample during 5 days of incubation at 20 °C and is often used as a surrogate of the degree of organic pollution of water. BOD is similar in function to chemical oxygen demand (COD), in that both measure the amount of organic compounds in water. However, COD is less specific, since it measures everything that can be chemically oxidized, rather than just levels of biodegradable organic matter.